Monitoring the outside of your property is as important to home security as keeping an eye on the inside, and a number of manufacturers are introducing DIY outdoor cameras to fill that need. The Vimtag B1 Waterproof Cloud IP Camera is one of the best we’ve seen, offering a simple, intuitive way to keep tabs on what’s going on in your front (or back, or side) yard, and its presence could help you deter an intruder before they break in. The B1 is a bullet-style camera, similar to the CCTV cameras you often see mounted outside commercial buildings. It features an aluminum-alloy body that’s designed to withstand the elements—it’s waterproof and has an operating temperature of 14- to 131 degrees F. A pigtail of three cables extends from the bottom of the preattached stand, offering an ethernet port, power port, and reset button. Attached to the side is a 3Dbi antenna for Wi-Fi connectivity. The camera itself features a 3.6mm lens, which is surrounded by more than a dozen infrared LEDs for night vision up to 20 meters. You can monitor your home’s surroundings in real time through the live feed, or set motion detection alerts to have the camera push notifications to your device when it sees movement. 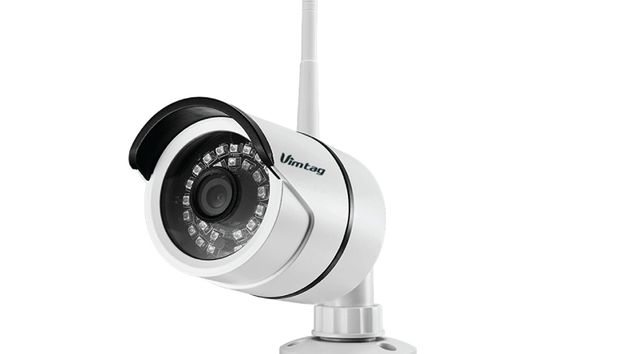 You can also enable the motion detection to trigger actions, such as taking a snapshot or recording HD (720p) video. Its name describes it as a “cloud” IP camera, but that’s a bit of a misnomer. The B1 does not connect to any public cloud to store its surveillance footage. Rather it comes with a preinstalled 32GB internal SD card for video recording and playback. The Vimtag B1 offers an simple outdoor security solution whether you want to thwart break-ins or make sure no one takes deliveries off your porch. It can be used with private cloud storage, however; namely Vimtag’s S1 Storage CloudBox ($150): a 13 x 9 x 3-inch unit that provides 1TB of storage and can accommodate up to four cameras. That’s something to consider if you’ll be using the camera for 24/7 recording, such as with a vacation home. You can also purchase the B1 outdoor camera and S1 CloudBox as part of a package that includes the Vimtag P1 indoor security camera. The $390 total gets you a complete home security solution. You can connect the B1 to your network via Wi-Fi or ethernet cable; the former being the preferred option for most people, particularly if you have an outside electrical outlet to plug the camera into, as this eliminates the need to drill a hole in your wall to run cables into your house. To set it up, download the free Vimtag mobile app, scan the QR code on your smartphone camera, and follow the on-screen prompts. The process only takes about five minutes. Once this is done, you can mount the camera to the exterior wall with the supplied screws. If you’re going to use the S1 CloudBox, it will need to be added to your network as well. You connect it to your router with the included ethernet cable (the camera will connect to the box over Wi-Fi), and then use the Vimtag app to scan its QR code and follow the wizard to create a device password. After that’s done, you have to access the camera’s settings in the app to enable the storage device for use with the B1 by scanning in the S1’s QR code again. The Vimtag app makes controlling your camera and managing security footage a breeze. The Vimtag mobile app is the same one used for the company’s indoor cameras and we’ve previously noted it’s delightfully easy to use. Tapping the B1 on the app’s home screen takes you to the camera’s live feed. Beneath it are buttons for manually starting/stopping a video recording, taking a snapshot, triggering a camera’s microphone (not applicable here as the B1 doesn’t offer two-way audio), and accessing the camera’s exposure settings. All the camera’s settings are accessible from the gear icon at the top of the app. The ones you’ll be most concerned with customize the camera’s motion-detection alerts. False alarms triggered by incidental movement are always a risk with indoor cameras, but they can be an even bigger issue outdoors where you have no control over the environment. Fluttering leaves on the tree in your neighbor’s yard could potentially set off a camera’s motion sensor if it’s sensitive enough. The good news is the Vimtag app provides plenty of options for minimizing erroneous alerts. You can adjust the sensitivity of the sensor for day and night independently on sliding scales of 1 to 100. You can also set up to four separate alert schedules to enable alerts only during times when you’re expecting some kind of activity, such as a package delivery. You can also turn off alerts completely; this is a useful option as it only stops the push notification, but still allows the camera to carry out video recording or another enabled action when it detects motion. The camera also provides several options for recording video, as well. In addition to recording only motion events, you can enable continuous recording or schedule up to four recording blocks. And as previously mentioned, you can manually trigger recording from the home screen if you see something suspicious on the camera’s live feed. The B1’s video quality is exceptionally detailed, with rich color representation and good contrast. Night vision is equally sharp and well-lit. Push notifications were prompt and the motion-detection customization settings really helped with the accuracy of the alerts. The B1 makes it easy to monitor your front porch, backyard, or any other area outside your home. Its real strength, though, is the app, which is easy to use and gives you a wealth of options for customizing your surveillance. If you’re using multiple cameras to keep tabs on your property, purchasing the S1 CloudBox probably makes sense as you get exponentially more storage for your recorded videos and they’ll all be saved on one device. But if you’re just investing in a single camera and not recording continuously the CloudBox is probably more than you need.